It was first thing in the morning and if I was looking for a writing prompt, I didn’t know it yet. But one came in with a “ping” by the head of my bed. My sister was riding a train between Boston and New York and texting me. Our father gave us our love of railroads when we were very young. On trips out West and to and fro Florida, what I recall most is my sister and I being all over that train. The giant sucking sound as we pressed the button to open the sliding doors between cars and the rollicking floor underfoot as we crossed between luxury Pullman, coach, dining, cargo, and caboose. We couldn’t believe children were permitted to do all this while steaming across thousands of miles. The train was our world. The porters our friends. It was as simple as that. I have but one vivid memory of my parents on these trips. 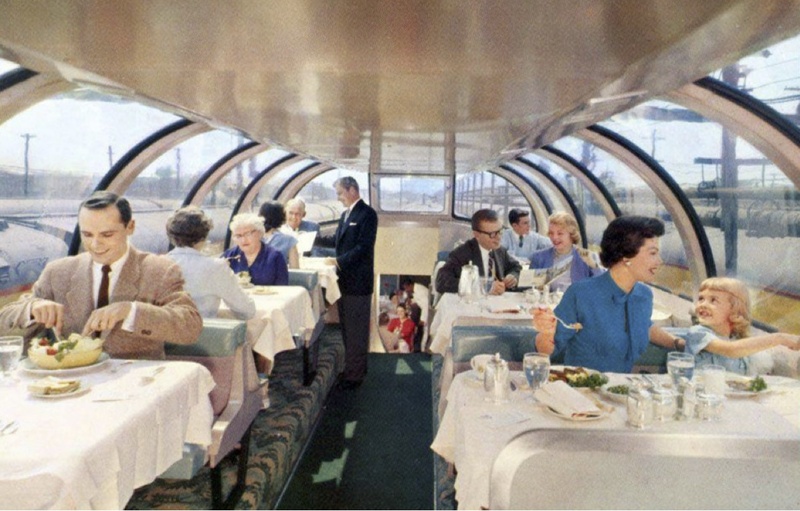 One evening, on a return trip from Florida, we had all gone to the dining car for dinner—how I loved the starched white linens and shiney silverware. While there, at a stop, cars were rearranged. Walking back, we found our sleeping car missing. Gone with all our luggage. It isn’t often you see your father befuddled like that. As advised we disembarked and waited by the tracks for another train—to connect us with our car on yet another train. In the dark of night, deep in Georgia, at a deserted station. The real South. This was beyond thrilling for a couple of Connecticut girls in patent leather shoes and white ankle socks. Did my sister and I ever wonder, ever ask, why all the porters were black? How did that not capture our imagination? Did it occur to any of us that we were traveling in a frozen moment of time? Although we’d been texting back and forth—my sister was the one who remembered riding on the tail end platform of a caboose—I hadn’t time to ask her this question. Her train pulled into Penn Station and I lost her to New York.